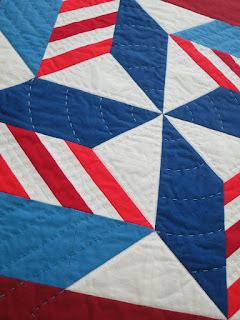 A familiar patriotic motif--red and white stripes--shows up in Linda's Patriotic Pinwheel mini quilt. Don't you love the hand quilting on her design? Find out more (and see the whole quilt...this sneak peek is totally tantalizing!) on Linda's blog, Flourishing Palms. You'll also have a chance to win a FQ bundle of our Patriotic Palette.